Подаємо рецензію Kenneth Turan, The Los Angeles Times на документальну стрічку «Переломний момент: війна за демократію в Україні», зняту Олесем Саніним і Марком Джонатаном Гаррісом, що від 9 березня 2018 року демонструється у Лос-Анджелесі. A man drives alone through a remote forest. He is headed toward a war zone. He looks every inch a soldier, but he is not. He is a man who started a theater school for children, who believes “beauty and art will save the world.” But then, on a day in Feb. 18, 2014, something changed. This is how “Breaking Point: The War for Democracy In Ukraine” begins. Other fine documentaries, like “Winter on Fire: Ukraine’s Fight for Freedom” and “Maidan” (named after Maidan Square in Ukraine’s capitol city of Kiev), have focused on this cataclysmic period in Ukrainian history, but “Breaking Point” has a different, more comprehensive approach. While those films dealt almost exclusively with the 93-day occupation of that central square, director Mark Jonathan Harris and his co-director Oles Sanin go a step further. Harris, a three-time Oscar winner whose films include “The Long Way Home” and “Into the Arms of Strangers: Stories of the Kindertransport,” and Sanin, a top Ukrainian director, have connected what happened in Maidan to what happened afterward, Russia’s annexation of Crimea and its predatory invasion of the rest of Ukraine. Thorough, impressive and smartly put together, joining dynamically edited verite footage with a series of thoughtful interviews, “Breaking Point” serves a pair of interlocking purposes. 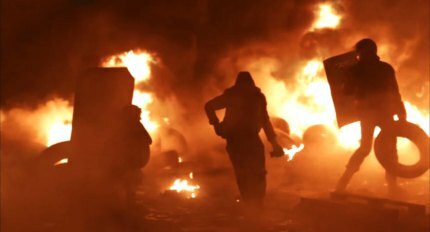 It enables viewers to catch up on one of the most highly dramatic situations of recent years, a heartening revolution in Ukraine that was as sweeping as it was a complete surprise. But “Breaking Point” is not just a history lesson. When Russian President Vladimir Putin took advantage of Ukraine’s chaos to invade, he did not just send troops, he unleashed a chilling disinformation campaign that looks from this vantage point like a trial run for the one in this country during the last presidential campaign. Everything started late in 2013 when Ukraine’s prime minister, Viktor Yanukovich, refused to sign a painstakingly negotiated deal that would have moved Ukraine closer to the European Union and instead indicated Putin’s Russia was his partner of choice. The protests began with small groups of students quietly occupying Maidan and began to escalate when the government sent the Berkut, a tough special forces unit, to roust the students. The most chilling interview is with investigative reporter Tetyana Chornovol, who vividly describes the circumstances of being severely beaten by pro-government hooligans. One week after Yanukovich fled the country, Russian troops, officially insisting they were local separatists though soldiers are seen on news footage telling reporters they are Russians, made a naked land grab. Though in many ways, the story “Breaking Point” details is as heartening as can be imagined, the filmmakers are too savvy not to end on a note of caution. As recent news stories have emphasized, one of the main problems Ukraine has is the internal one of belief in rule of law in the face of a legacy of corruption that remains hard to stamp out. It is bad news for us all if it cannot.